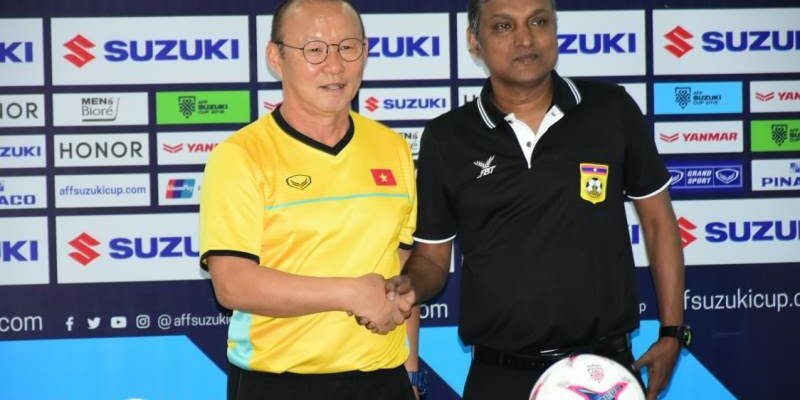 VIENTIANE (7 Nov 2018) – Vietnam’s Park Hang-seo will be holding fast to his philosophy of ‘One Team, One Goal’ as the team look to land only their second ASEAN crown when the AFF Suzuki Cup 2018 opens tomorrow here in Vientiane, Laos. Vietnam will open their campaign in the 12th edition of the hugely popular football tournament with a match against Laos at the National Stadium KM16. The South Korean tactician was at the helm of Vietnam’s two strong performances this year – at the AFC U23 Championship in China where they were the losing finalists and also at the Asian Games 2018 where the team finished fourth. No doubt, expectations are high from the team and especially from a wanting Vietnam fans and public, who thirst to taste the sweet taste of victory. “The expectations from the fans are always there. But I can handle all the pressure. I have done it before in China and I did it again in Indonesia,” said Hang-seo. Choosing a young squad to carry the mantle, Vietnam have selected a blend of 15 players under the age of 23-years-old alongside eight senior players. Hang-seo said that the mixture of having younger players in the squad will make the team more dynamic and that is one thing which Vietnam will be counting on. “I have only seen Laos play Bangladesh on video. But that will just have to do,” he added.